Yesterday, from my 2nd floor office window, I watched a curly tail lizard chase a squirrel ten times his size up the wall of the neighboring building. The squirrel and the lizard locked in a stare-down until the squirrel realized he was much bigger and jumped back to the ground. The lizard immediately charged and the squirrel freaked out. With this strange adversary underfoot, the squirrel began bouncing like a gazelle while the lizard darted back and forth underneath trying to get a mouthful every time the squirrel touched down. 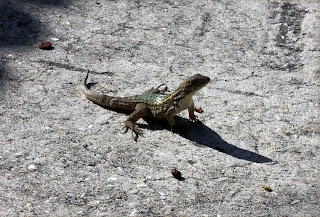 The squirrel eventually escaped undamaged except for a brand new phobia and the lizard strutted back into the parking lot. He is patrolling as I write this. That's him pictured. Condo owners, you too may have a feisty little adversary hiding in the shadows waiting to attack when you try to sell or lease your unit. That human curly tail might be disguised as the condo association's property manager. Most associations have an approval process for tenants which is often handled by the management company. When a unit is sold, an estoppel letter, copies of insurance policies and other documentation is required. These, too, are often provided by the management company. Some management companies are helpful partners in the selling or renting process but they can sometimes be a frustrating impediment. I've run into bad property managers twice in the last couple of months. First was when a client tried to lease his unit and the condo's property manager made crazy, illogical attempts to block the lease. I found out that she has a well-earned reputation for being difficult. I will be warning potential buyers in this complex about the problems they may face if they think they want to own there. I ran into the same property manager last week when a client was closing on a luxury oceanfront condo in Cocoa Beach. The buyer's lender required some insurance documentation and was referred to the manager for it. Ms. Happy blew up on the processor and refused to produce the documents in a rather flamboyant manner. The loan officer described her as "bitchy" and asked for my help. Unlike the squirrel, I chose to remain perched safely out of her reach and made calls to a Board member to see if I could round up the docs without her involvement. He was happy to hand over the required documents and the sale closed. Had I been unable to contact a Board member, the unit would not have closed. I'm guessing/hoping someone's contract might not be renewed. It would be prudent for all condo owners to pay attention to feedback from agents and fellow owners about experiences with the management company or even to do an anonymous request for documents. Boards and unit owners are often unaware of their manager's manner of responding to requests from lenders and buyer's agents. I'm guessing that most owners in the two complexes I've mentioned would be outraged to know how their manager is working against them. Association managers do more than handle meetings, enforce restrictions, collect assessments, reports and maintenance. If their people skills are bad, their great skills at the other stuff doesn't matter. There are too many helpful, professional property/association mangers good at all aspects of the job to put up with one who is sometimes working against the owners' best interests. For the record, so no innocent association manager is suspected, this bad one is not in Cocoa Beach or Cape Canaveral. "Reality is one honey badger. It don’t care. About you, about your thoughts, about your needs, about your beliefs. You can reject reality and substitute your own, but reality will roll on, eventually crushing you even as you refuse to dodge it. The best you can hope for is to play by reality’s rules and use them to your benefit."